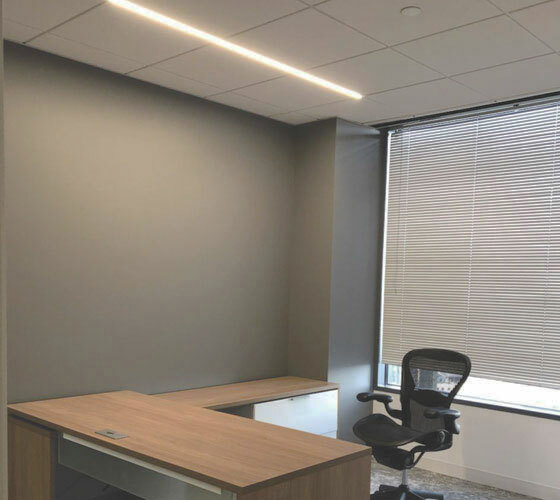 The straight-forward aesthetic of Airelight Linear SC luminaires complement this modern office space and bring a unique flexibility to lighting design. These low profile LED luminaires attach directly to the T-Bar grid and fit perfectly between ceiling tiles. Held in place with integrated magnets, the luminaires are easily moveable allowing for redesign at any point. Available in two widths (0.5 and 1.0), Airelight Linear SCs are compatible with both the 9/16 inch as well as the 15/16 inch ceiling grid. At less than 5mm thin, Airelight Linear SCs are capable of up to 770 lumens per foot. Fully dimmable and available in 2700K, 3000K, 3500K and 4000K color temperatures. Airelight™ Luminaires are plastic free, non toxic and have a Red List Free Declare Label making them the most sustainable lighting available.